In this UBA DX contest I experimented with the new built Booster cylinder dipole. 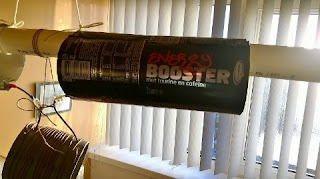 The Booster antenna is called Booster, because each cylinder is made out of 4 Energy Booster cans, that are cut open and bolted together. The length of the cylinders is 22 cm (9") and the wingspan of the antenna is 55 cm (22") The booster is hanging in the dormer window at the second floor. The coil is wound on a 110 mm PVC tube and has 15 turns. The Booster resonates on 10 MHz. It took my a long time to discover the right setting of the tuner for the Booster on 20 m. At first I could not get a good matching at all on 20 m. The SWR was too high. At the end of the contest, I discovered the right setting for the tuner to get a SWR of 1:1 This is the setting that I always use on 10 m, with the inverted Vee. hi. 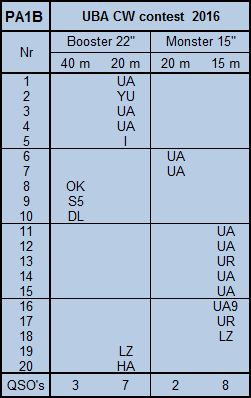 The table below shows the QSO's in chronological order. The table shows that in the first 5 QSO's, I used the Booster on 20 m. The Booster is longer than the Monster, so I expected much of the Booster on 20 m. But I could not get a SWR of 1:1. After the first 4 QSO's, I made an extra tap on the center of the coil. By using this extra tap, I connected the twin lead connectors just ONE turn apart. The SWR was now slightly better but not 1:1. After 5 QSO's, I was a bit disappointed. 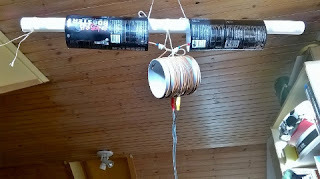 Just to make some QSO's, I decided to switch the shorter Monster energy can antenna, which is located in the the shack, also on 20 m . This antenna is easy to match. I could easily make two QSO's with UA. The monster is doing fine on 15 m. A total of 8 QSO's were made on 15 m. The signals in QSO number 14 were very strong so I reduced to 800 mW. My experimenting payed off. I found out by desperately playing around with the tuner, that I had to use a very strange setting of the tuner to get a SWR of 1:1 - Finally I got the Booster working on 20 m. With this setting the last two QSO's were easily made. hi. De blikjes komen van de straat. Ik drink het niet zelf. Energy Booster is verkrijgbaar bij Trekpleister voor 39 Eurocent.